I suggest playing two repeats of each mode, in order, then going back up the page two choruses at a time, from dark to light. 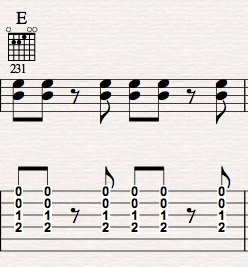 Here's a chorus of C Blues in the Phrygian mode. 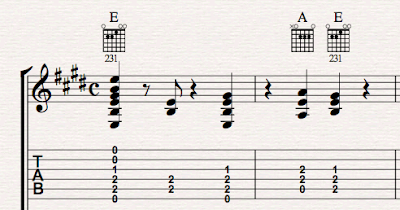 If you played these changes during a chorus of "C Jam Blues" you would take that tune to a place Jazz musicians call 'out', because you are playing musical ideas that are outside of the musical vocabulary of the composition. Much of the funky harmonic substitution that you hear in early Bebop from the early 40's and even into Hard Bop of the 1960's uses borrowing from minor, as well as borrowing from Phrygian to create more points of tension in the melodic and harmonic cadences. Check out the frequent use of the open third string in this one. Lots of chiming or twanging G droning almost all the way through this chorus. I don't hear this as the first chorus of this particular blues. You could easily simplify this Aeolian blues by omitting one chord from each bar that contains two distinct voicings. Then play it again putting the voicings you removed back in. Beware the funky mb2 and Susb2 chords. Those are b9 chords that have no 7th in them. The Minor b2 has a minor third. The Susb2 has no third. It's a quartal voicing. I was particularly tickled with the voicing in bar 10. It has a tone cluster of G, Ab and Bb in the bass that is just so gnarly. Probably not too good with your fuzz pedal, though. Unless you're into that sort of thing. 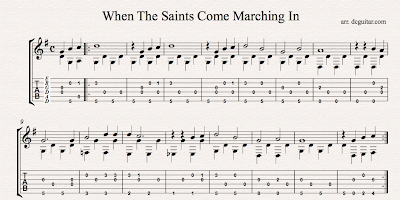 Here's a quick little fingerstyle arrangement of "When The Saints Go Marching In" I started working on for kicks in a lesson today. Please note, the guitar tuning is Drop D. Hence the silly name of this post. Very simple: just an alternating bass and melody. Should make for a decent starting point for anyone wishing to flesh out their own arrangement of this New Orleans Jazz Standard. 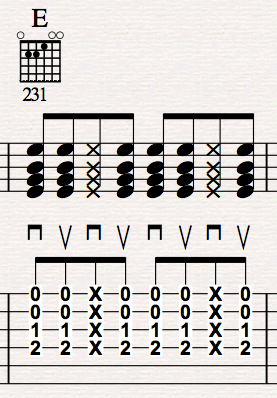 You could add a third part on the higher strings or thicken the voicings a little in the bass if you are clever. If time and attention permit I'll return and tweak the arrangement some more. This chorus of blues in C dorian should be played with a crescendo that climaxes with the return to the tonic chord in Bar 11. At least that's how I hear it. Check out the melody line and dynamics that are created by limiting how many strings are used in each chord voicing. Starting with four voices, I steadily increase the number of voices in each voicing over the duration of the form. In Bar 4 I go from 4 voices to 5. I dip back to 4 voices on bar 7. Then I pump up the volume with 6 voices on bar 8. This dynamic shift is like an Echo of the shift to 5 voices four bars earlier. It helps delineate the form. I hear the last bar getting a little quiter with its trip from 6 voices back to 5. Possibly starting the next chorus with four voices. But it could go other places, too. Where would you take it? Please notice that this blues is NOT strictly in the C Mixolydian mode. It's a mixed mode. The harmony goes a little bit 'out' with the chord that is highlighted in blue. The second chord in the 10th bar of the form is a Db Augmented 6th chord that borrows from two other parallel modes in the key of C. The Db is borrowed from C Phrygian. The B natural could be considered borrowed from the C Ionian mode, but perhaps because of the Phrygian Db, my ear hears it as borrowed from C Harmonic Minor. They've built something, indeed, this band from Brooklyn and Minneapolis. It's a little early to know if they are going to be anointed for anything yet, so the title of this review is a little tongue in cheek. But just a little. 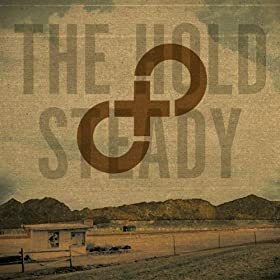 Perhaps this is why I'm I'm so amped: Listening to Stay Postitive, I feel charged with that adolescent fervor that clues me in that this band rocks. The drummer is killer. The musicianship is disciplined, but not too conservative, which I like. They are not afraid to take a riff out on a limb and shake those peaches. There's some superior riffage here. If this were a professional review I'd be obligated to single out and name-check the lyricist in this band. But in deference to the team spirit embodied in their latest outing, Stay Positive, I'm going to just say that the stories in these songs are fantastic. There's an eye for detail that would make Lou Reed proud. It started when we were dancing. It got heavy when we got to the bathroom. we went to some place where she cat sits. but every thing's fried here in Memphis." Now they want to know exactly which bathroom. Dude, does it make any difference? That's alright, I was desperate too. I'm getting pretty sick of this interview. There's plenty Hitchcockian knowledge on display in the Hold Steady's dense lyricism. They know that some things are truly better left unsaid. It gives a thrill. There's as much going on underneath the surface of the lyrics as there is right on top, so I can rock out or tune in as I please. Buy Stay Positive at Amazon here. What the heck is modal blues? The truth is, Blues, as we traditionally know it, is a mixed mode. But how can we understand a mixed mode if we don't know the modes on their own? A lot of music teachers make a lot of hay about the Modes of the Major Scale! Here's the first of a series of lessons on these modes. I'll be starting by taking on the modes in the key of C from light to dark, with a trek through a familiar twelve bar form in each mode. The 'lightest' or 'brightest' of the modes is Lydian. A major scale with a raised 4th degree: F# instead of F. One sharp, no flats. In fact, some musicologists could argue that the key signature I've given here is wrong. However I didn't want there to be any ambiguity. This tune is in C Major, Lydian Mode. Sing a major scale and then raise the 4th degree. To many western ears, this sounds a little exotic when sung like this. But getting to know this sound well will really help you understand secondary dominants and some other common practice period stuff. Here's a 12 bar blues to jam on while getting to know the sound of the Lydian Mode. Have fun making some melodies and learning some whirlies in Lydian. All 12 Bars in one shot for your printer. As you master the passage or technique, and can complete it 3 consecutive times consistently, you can increase by one layer of difficulty. Add another passage or technique OR increase that metronome marking OR work on trickier syncopations or dynamics. Don't try all three at once, though. Add one layer at a time so that you can fully concentrate on that element. Three times. I have to admit this book made me a little uncomfortable when I first started reading it. The motherly, nurturing, psyscho-babble-esque tone made me want to hurl. I didn't want this book to help me. I wanted to help this book into the fireplace. Every morning, set your clock one-half hour early; get up and write three pages of longhand, stream-of-consciousness morning writing. Do not reread these pages or allow anyone else to read them. Ideally, stick these pages in a large manila envelope, or hide them somewhere. Welcome to the morning pages. They will change you. I tried this technique, and I can attest that it works. I learned how to write songs and music by starting with morning pages six days a week to open the creative space for myself. Just the act of sitting down to write regularly takes the fear out of doing it. Turns out that Woody Allen was right. 90% of life Is Just Showing Up. Writing is about showing up and putting pen to paper. Do it enough and you will write something. Do it a lot more and you will write something good. The morning pages operate like priming a creative pump. You get the flow going, and sooner or later, something of substance will arrive. There are also some other techniques in there that are helpful, especially if you tend to fight your self doubt as an artist. Rather than simply using our right hand to mute the strings as we did in the 'Proud Mary' Strum and Bo Diddley Beat in previous lessons, we can employ one of my favorite strumming techniques, the muted strum, to generate a little more funk. A muted strum is a combination of strumming across the strings while muting as we did in this lesson. As your hand comes down in your smooth strumming motion, you mute the strings with the palm of your hand, and then rake the pick across the strings while the strings are muted. You create a percussive 'whack' that can really propel the rhythm nicely. In this example, the muted strums on beats 2 and 4 give us a nice strong backbeat, which is essential to the rhythmic feel of rock and roll music, if you wanna dance with me. Once you get the hang of it, you can apply this same technique to any rhythms you feel need a little punch. I'd really like to demonstrate how this technique looks and sounds. Audio/video capability are coming soon here to dcguitar.com. In the meantime, please enjoy a couple of youtube videos I found to help demonstrate the muted strum technique. Who Got Yo Ya Ya's Out? Once you have your right hand muting technique down, the Bo Diddley beat is a great way to learn how to create some more interesting syncopation in your rhythm playing. Legendary rock rhythm guitarists Pete Townshend, Keith Richards, Andy Summers, and The Edge are all masters of this funky rhythmic clavé. You need to play right hand mutes on beats 2 and 3 of the first measure, and then on beats 1 and 4 of the second measure. All other downbeats are played as down strums. There is one sounded up strum on 'the and of 2' in the first measure. I'll be back soon with more detail.